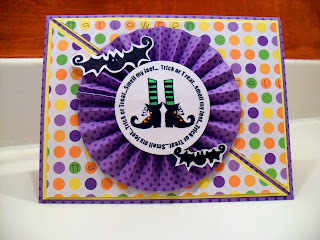 ** I have two posts today, so if you are looking for the Sweet Stamping Treats Halloween Challenge post, please go HERE. Welcome to the What I Love About Fall/Halloween Blog Hop. This hop is scheduled from Oct. 7 at 8:00 am through Oct.8 at 11:00 pm(central time). For today's project, I created a fun Halloween card. I remember, as a little girl, always looking forward to Halloween so I could go trick-or-treating with my brothers! Oh, how I looked forward to all of that candy! LOL! As a mother, I have enjoyed taking my oldest daughter out to get candy each Halloween, too. Now, she is a teenager and prefers going with her friends. I have another daughter, but she is much too young to go trick-or-treating right now. This year, we will be staying in to pass out candy, and I'm looking forward to it! For my card, I used a cute stamp that says Trick or Treat Smell My Feet. LOL! I know many of you will remember that funny little rhyme from your childhood. Unfortunately, I don't have the information on who makes this stamp. I punched out the image with a circle punch and then colored with Copics. The bats are also from the same stamp set. I actually colored over the eyes of one bat and meant to color the eyes over in the other bat but forgot to do it before I took this picture. Oops! I used my Martha Stewart scoreboard to create the rosette. All of the pp is by Doodlebug. I love the bright, fun Halloween colors! Your next stop is Melinda's Blog. Have a great day and please stop back tomorrow for another great project. Awesome project! Very very cute! Colors are awesome! COLOR!! I love color!! And you have it all right here...the rosette is so pretty and I think the purple was the purfect color to use. I do remember the Thick or Treat smell my feet and we finished it off with Give me something good to eat!! :) Super cute! Love the purple rosette and the cut stamp. Love the polka dot paper. Really makes the rosette pop. Great cards Dena, love your one for SST too. I think you card is so wonderful I like the color it is different from the standard blank,orange & purple.I am a new follower. Your Halloween card is awesome. I love the rosette. I am a follower. I absolutely love your card, might have to scraplift it. lol Thanks for joining me for this hop, I really appreciate it. LOL love this card, so funny and cute!! very lovely card! love the colors you used. love it and that rosette is fabulous, the color is awesome!!! Awesome card! I love your work. I am a new follower! Adorable! The colors really grab me too! Thanks for joining us over at Forever Night Challenges! !